Stretchy string is so much fun -- you can pull it, twirl it, squeeze it, tie it in knots. Tie knots into the ends of these squishy strings for easier grasping. Use alone or link a few together! 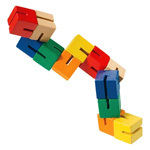 A great item for enhancing both hand strength and kinesthetic learning! Enhance focus and absorption when you give these children something to do with their hands. Great neon colors. Selection will vary. Each sold separately. Fuzzy and multi-colored, you won't be able to put this Tangle down! 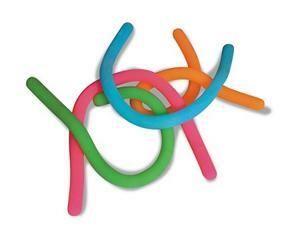 Here it is – the scrunchable, stretchable, changeable, squeezable, shapeable Geo Twister. A fantastic activity for the development of hand skills and a great fidget tool!